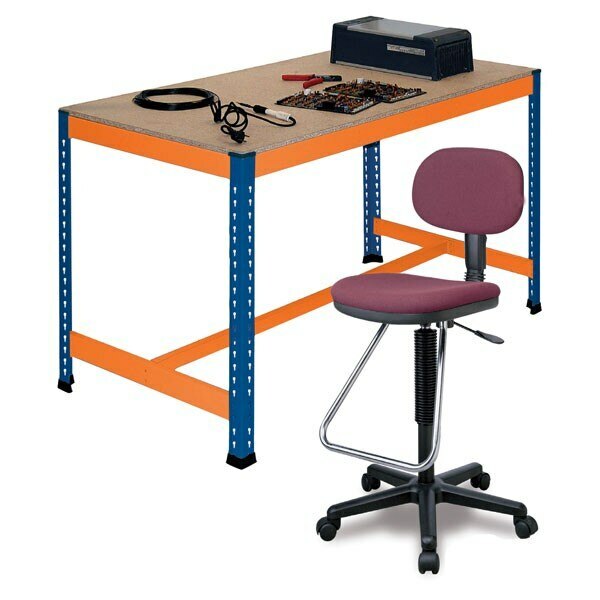 These workbenches include a very convenient foot rest support that is adjustable in height. This feature increases productivity, making daily tasks more comfortable, and its plastic feet prevent damage to floor surfaces. Whether in a factory, warehouse or workshop, this workbench with foot rest provides an extra support surface; and meets all kinds of project needs thanks to its high durability, withstanding loads of up to 1,000 lbs. For safety reasons this and all Metal Point system workbenches incorporate a cross-tie centrally and perpendicularly to the beams, to produce a more rigid structure, as well as to act as an extra support element for the particle board. Excellent quality materials: 14 guage steel parts, 5/8" thick M2 industrial grade particle board. A multi-functional, durable and very comfortable workbench for seated work. Workbench includes 4 vertical posts with plastic feet, 1 shelf with particle board and a foot rest level.